Reading through Nigella Lawson’s new book Kitchen, which continues to make me want to cook everything from its pages, her Chocolate Orange Loaf called out to me (not literally…though give it time). Plain, dark-brown, oblong, it’s nothing fancy to look at, and in fact I was almost about to make her Blondies which has cool stuff like chocolate chunks and condensed milk in it. But then fate, or maybe something way less dramatic, like me just making a different decision, intervened. And I’m not even that fussed because I’ll probably make the blondies too before the weekend is out. Either way I’m glad I went the way of the chocolate-orange combination, forgoing my Jaffa-indifference, because the result was pretty stunning. Set your oven to 170 C/340 F and butter and line a loaf tin (or hunt down a silicon one). Beat the butter, golden syrup and sugar together. This is the hardest part, really – it tastes so good. Nigella asks you to alternate the dry ingredients with the eggs but I didn’t have the energy and I’d somehow already made a ridiculous mess so I just beat in the eggs – which makes the mixture much lighter and aerated – then folded in the dry ingredients with a metal spoon (more control than a fling-y spatula), followed by the orange zest and juice. Don’t fear if it looks a little curdled at any stage. Pour into the tin and bake for around 45 minutes. I was worried that I’d overcooked mine – it looked a little ‘solid’ round the edges. 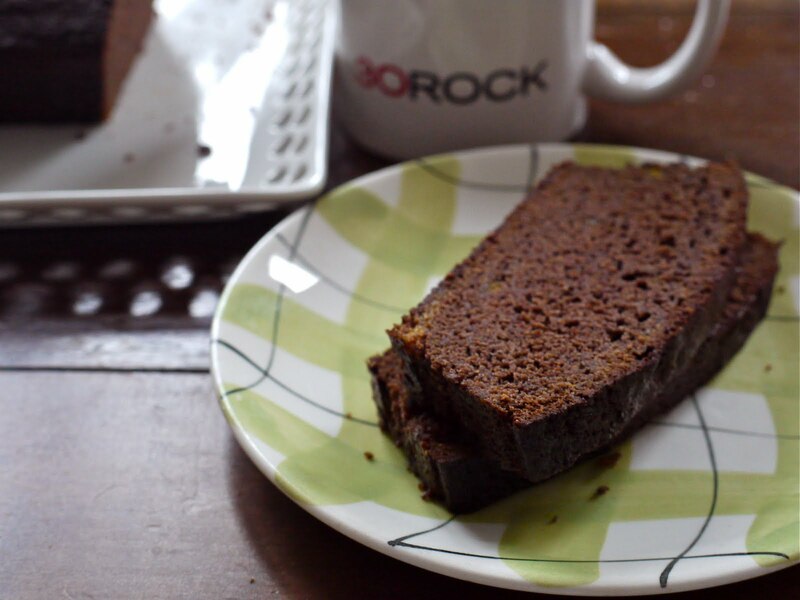 I considered doing my usual cake-rescue method of making up a syrup to pour over, but after curiously slicing off a sliver, it turned out the loaf was just fine. Better than just fine, even. The orange flavour isn’t overpowering, more fragrantly suggested than in-your-face, but what’s there is completely delicious. 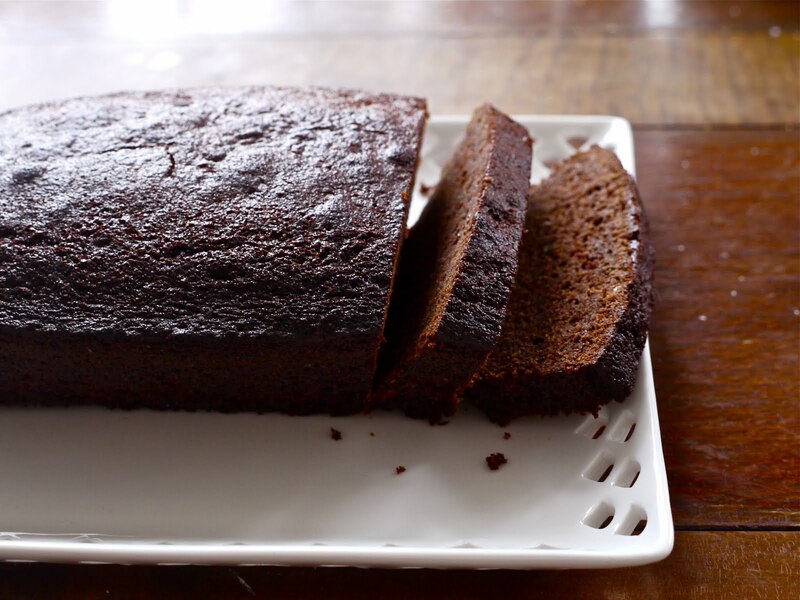 The citrus and the caramelly golden syrup seem to pick up something good in the dark, dark cocoa, giving the cake an almost gingerbread intensity of flavour even though it’s very light-textured. It’s seriously good with a cup of tea and I reckon it would be amazing spread with cream cheese but unfortunately I didn’t have any in the fridge to test this theory. I’m not sure how long this would last for but it seems to be one of those Bernadette Peters-style cakes which just keeps getting better and better as the days go by. Title via: The Flaming Lips’ sweet tune She Don’t Use Jelly from Transmissions From The Satellite Heart. Which cavalierly rhymes “store” with “orange”. Whatcha gonna do? I’ve been on a bit of a Sondheim kick, although it’s more like a Rockettes kickline than a solitary burst of commitment…I’ve been listening to so many interpretations of his music on youtube lately that linking to just one is a bit misleading but feel free to enjoy the late Eartha Kitt’s I’m Still Here from Follies. Yesterday we bought Aloe Blacc’s new album Good Things, and the title doesn’t lie. It is a bit gloomy towards women but if that’s the experiences he had prior to writing these songs, well I guess fair enough, and it’s nicely balanced by the lump-in-throat inducing Mama Hold My Hand. The bouncy, catchy I Need A Dollar would be his best-known track but I love his slow-paced, sultry cover of Michael Jackson’s Billie Jean, which isn’t actually even on the album. Go find Good Things, it’s very easy to like. Next time: I have so much Nigella going on right now that I’m probably going to have to hold up before I end up reproducing her entire book here on this blog. I’ve also made and loved her Apple Cinnamon muffins and crustless pizza and so they’ll no doubt end up on here soon. Gaaahhhhh bookmark bookmark bookmark. If I hadn't just used up the last bit of butter in the house baking Meyer lemon shortbread, I would be rushing to the kitchen to make this chocolate orange loaf cake IMMEDIATELY. Chocolate + orange is pretty much my favourite flavour combination ever. I have a friend who wasn't sold on the combination also due to not being fond of Jaffas (I had to enlighten her palate by baking an orange chocolate tart), but Jaffas… well, I don't want to hate on them, but they don't exemplify the combination at its absolute zenith (as a child I would often pass up Jaffas but the greatest thing you could have given an 8-year-old me was a Terry's Chocolate Orange). So I need to make this cake, like, already. Can't wait. You can't fool me, Laura. Not with all your lyrical prose and rapturous descriptions. Jaffas make me nauseous, and as much as I'd like to have faith in Nigella, I simply cannot force my hands to procure oranges for this recipe. But more importantly… Hubba Bubba really was so fleeting in flavour, wasn't it? It was like… HELLO TASTY, then two seconds later, HELLO FLAVOURLES LUMP. And most importantly: I was listening to Assassins while reading this. Sondheim forever. I know what you mean–I never chewed gum (hated the taste of most candy) but it always seemed the thing to do…and I *was* American. Also, drinking milk. Yummy looking recipe as usual! 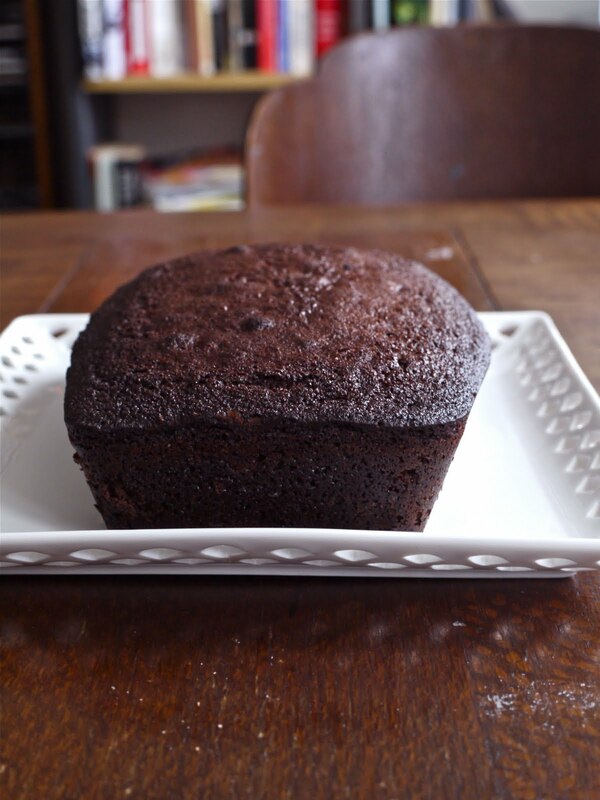 Love Nigella's recipes & chocolate & orange go well for me, so this ones a keeper. Hannah: Oh yeah, I remember – orange-hater! Actual gingerbread would be definitely a good decision. And yeah, what's up with the disappearing flavour? And yet I continued to chew? Sadako: Drinking milk definitely seems very American, even though we're supposedly a thriving dairy economy down here. I made this yesterday – much lighter and spongier than I was expecting but oh so delicious – thanks for sharing! i have never combined orange with chocolate before. it sounds great! thanks for sharing!